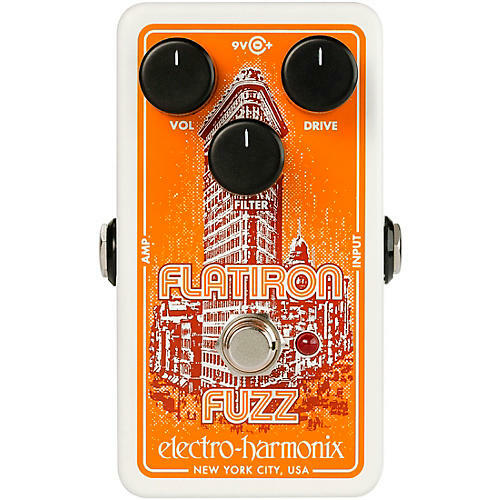 The Electro-Harmonix Flatiron Fuzz is an extremely versatile, classic op-amp powered fuzz/distortion. At lower drive settings, it remains fairly clean and adds a pleasing mild distortion. As the drive is turned up, it transports you to a world of arena rock and produces spectacular, thick, meaty tones. The stellar sound of the Flatiron Fuzz is a result of its circa late '70s, classic-style circuitry and the fact that it delivers symmetrical hard clipping. As a point of reference, you might refer to the old Rat pedal, but we think you’ll prefer the Flatiron. The Flatiron Fuzz features three controls: Volume, Drive and Filter. Volume sets the output level while Drive adjusts the amount of sustain and distortion. The unique Filter control is actually a low pass filter with a movable cut-off frequency. This is especially cool because it lets you dial in just the right amount of high-end, from dark to raunchy.